So.. 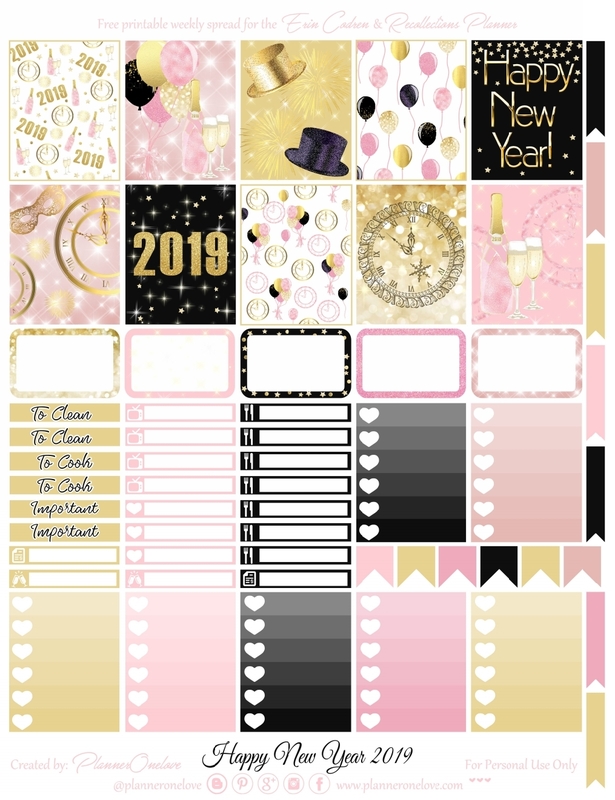 I've been requested by several fellow planners to recreate this New Year spread from last year with 2019. I know it's the same spread lol. But that's what some people wanted. & honestly I'm so grateful many of you reached out to request it. It makes me so happy you like it enough to want to be able to use it for your new year. Not only did I update it for the new year. I also took some time to create a New Format version of this spread for the cutlines. I also edited some things that didn't work out so well last year. For example the text color. I usually like using white text for the headers. But in the case of this spread the backgrounds for the headers were a little too bright and the white letters just did not show right when printing. So I wen't ahead and made them black. I hope that's okay. I think it makes it easier to see and still goes with the theme for that extra pop of black. As always I hope you enjoy this one. But before I go I really want to take some time to say Thank You. 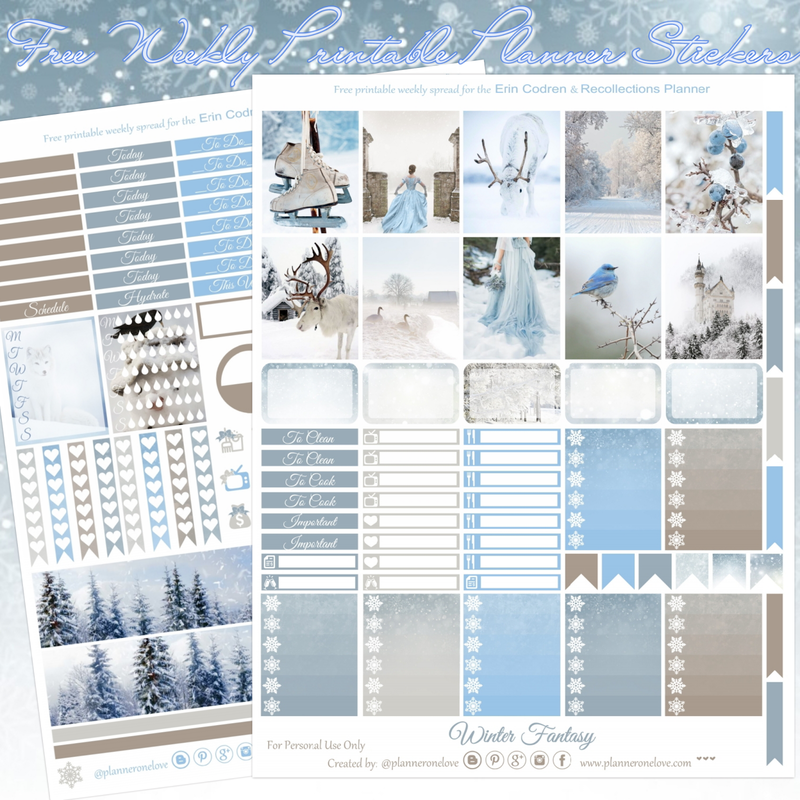 Thank you so much to everyone who has found their way to my page & downloaded my printables. To everyone who has posted their beautiful spreads on their socials & tagged me. It's been a crazy year. A lot has happened & I'm so grateful to everyone who has stuck around & continued to follow me. Despite going mia a few times lol. A year ago I was celebrating 100k pageviews on my website & today were closer to 1 million. 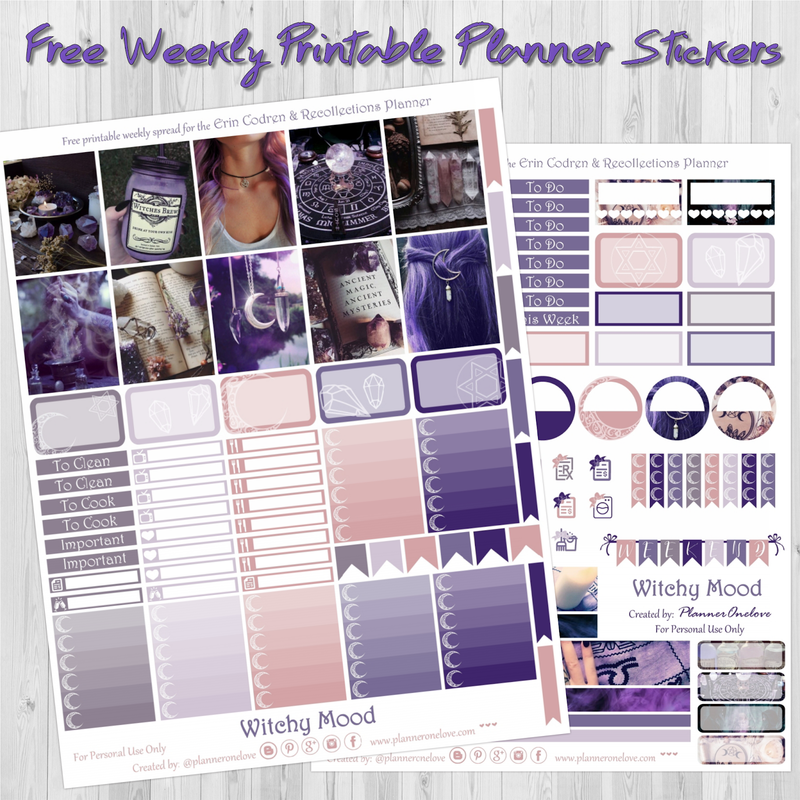 I'm so happy that my printables have reached so many people. I'm also super grateful to everyone who has supported me this year. Either by buying my PWYW kit or donating through my paypal. 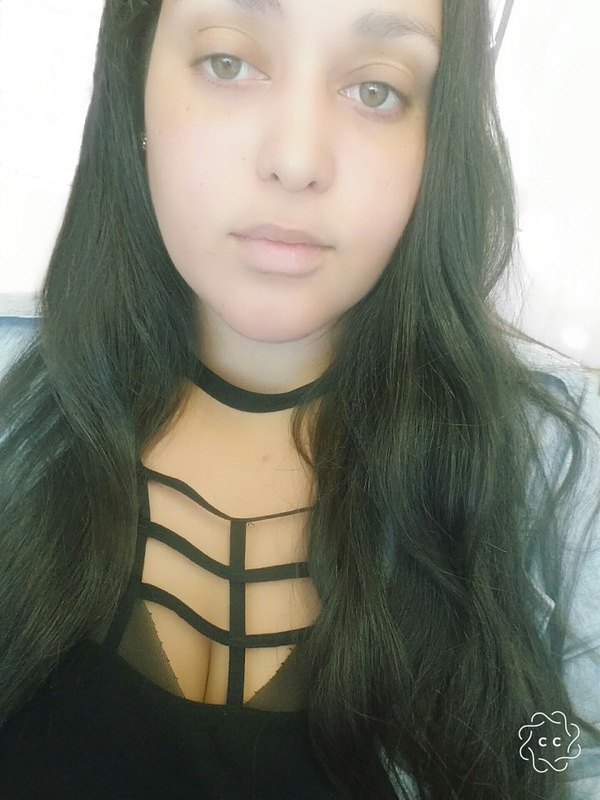 Even just sharing my page and socials with others. You have no idea how every little has helped me. So again, Thank You, Thank You, Thank You. I hope that you stick around next year. There are some great things coming! 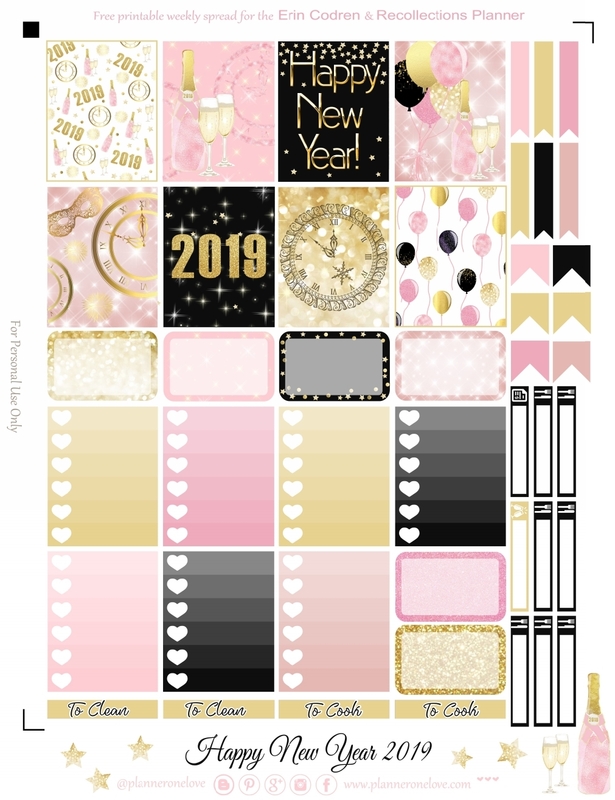 Description: Sparkly New Year's kit with beautiful bright pink & gold shimmers & a bit of black. Deco: Champagne bottle & balloons to celebrate. I know I've been gone for a little while. If you follow me on my insta you probably heard I was in the process of moving recently. So the month of November was a little hectic. I spent most of my time looking for a new home, gathering the things I needed to move out, packing, moving & finally settling in.... So unfortunately I that didn't leave me with much time for planning. But this week I finally finished setting up my office! I'm so happy at my new place. & grateful to be able to have my own room to craft & do what I love. Yay! Now that all of that is done & my office is no longer in boxes. I'm so exited to start planning & creating again. 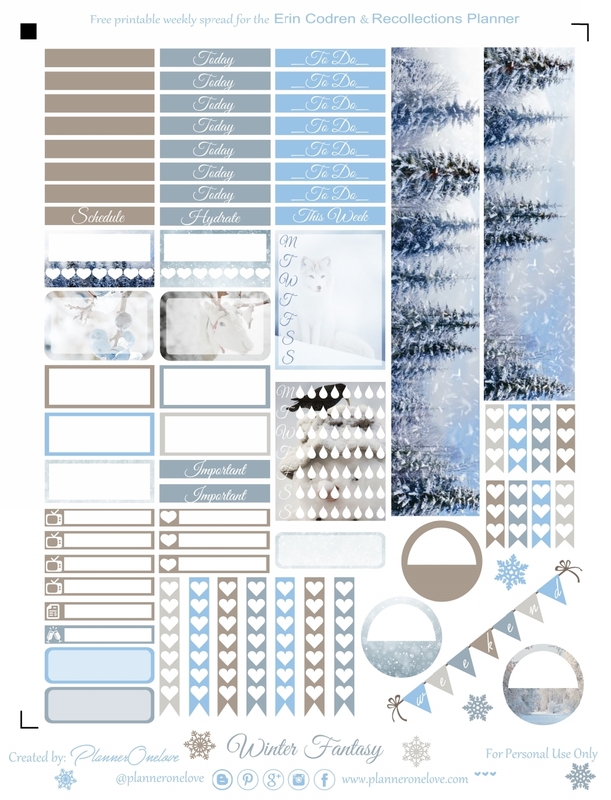 I'm also superrrrr excited for winter & Christmas kits. 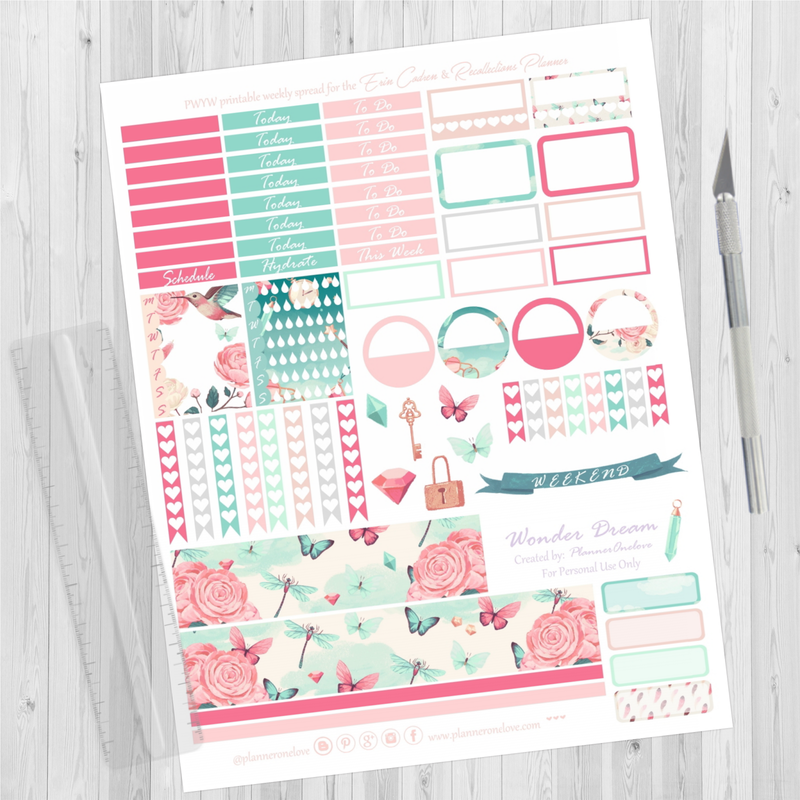 I cannot wait to bless my planner with new printables! 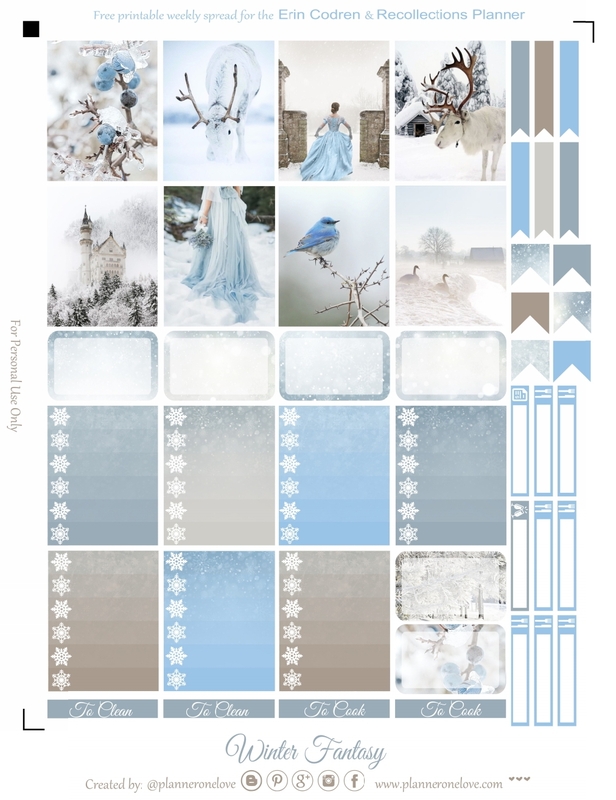 So to kick of the season I have created this beautiful snow/ winter fantasy kit. It reminds me a bit of Cinderella or some kind of fairy-tale winter princess. Something about the white with the blue & the bit of sparkle shining throughout. Ughhh I love it so much. But I don't want to bore you with too much talking. Just wanted to give a quick update & let you know why I hadn't been posting much. Okay, I know you can't wait to get your hands on it lol... so go on... scroll down. I'm finally back with a new spread. This printable should have been posted weeks ago but I was a little distracted by... life. lol. 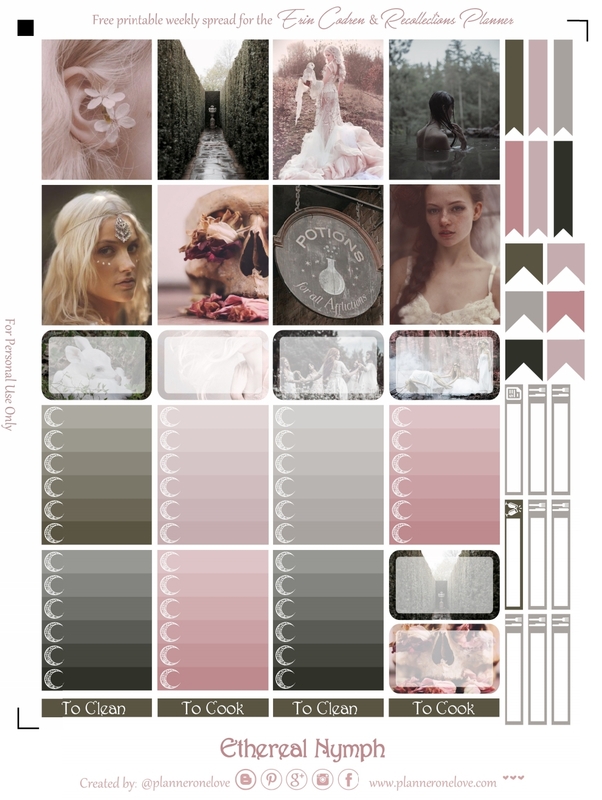 This weeks theme is inspired by a mood board I found on Pinterest. If features so many beautiful women and nature. 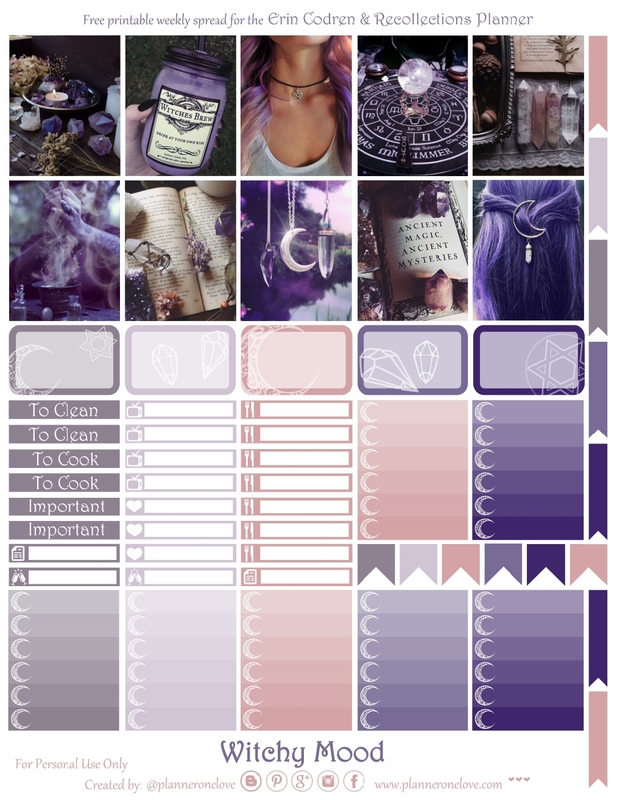 I posted a preview of this spread on instagram for help in choosing a title. & many came threw with some awesome suggestions. One title that stood out the most to me had the word Nymph in it. I thought this word was so fitting for this spread. & So I decided to title this one Ethereal Nymph. When I googled ethereal nymph I found a lot of beautiful editorial photographs on women in nature. I was tempted to change many pics in the spread. But I really like these came together. 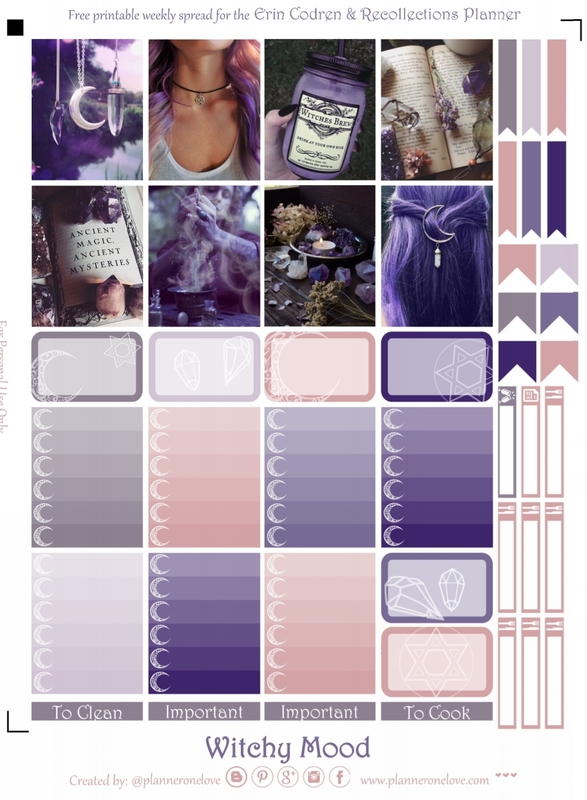 I am definitely inspired to create another spread with a similar theme in the future. Description: Nature nymph inspired spread. Filled with greens and pink tones. We're getting so close to October & Halloween! I thought I would welcome the spook-tacular season with a cute witchy spread. For this kit much like lasts years Wicked Burgundy kit. I really wanted it to feel like halloween while keeping it a little classy. I love the hint of witchy vibes along with the beautiful crystals & herbs. It's witchy but in a cute magical glam way. Pairing it with the purple & pinkish tones keep it light & whimsical. I love the moon I found & used for the checklist as well as the clear crystal outlined clip-art. I think they give the half boxes a little something extra & ties in with the theme very well. As always I hope you all enjoy this one. 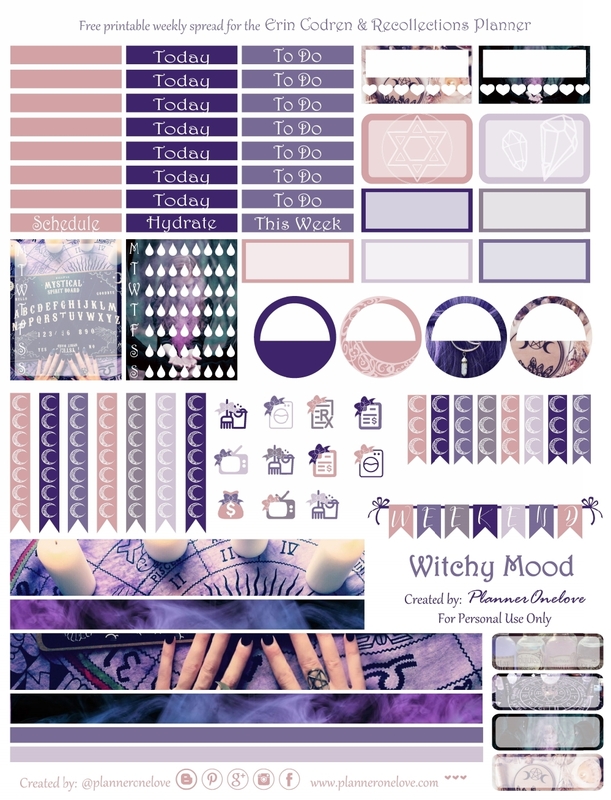 Description: Witchy halloween spread. Full of crystals, herbs & magic. Paired w/purple & pinkish tones. It here! My first official PWYW kit. If your unaware of what that means let me break it down. 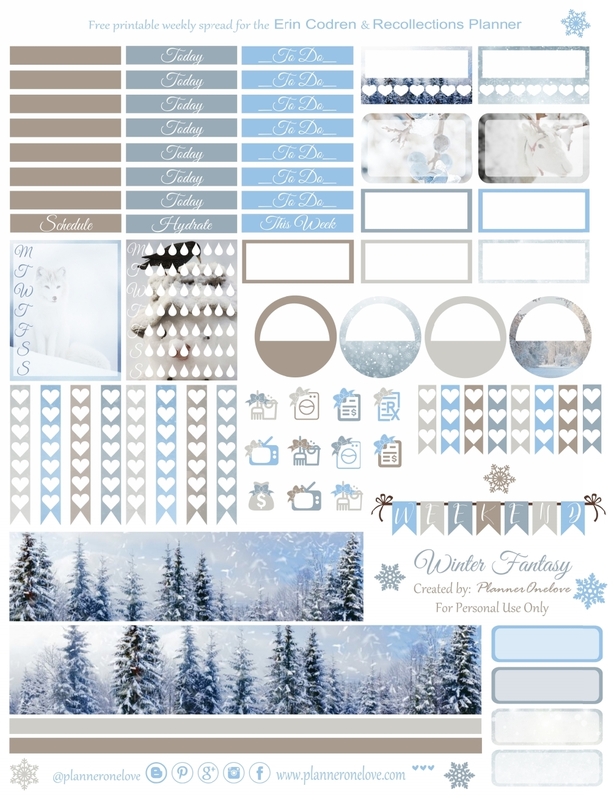 PWYW kits or Pay What You Want kits are printable planner sticker kits that you can purchase here. & the best part is that you get to choose your price. Pay what you personally can afford or what you think they're worth. They will be formatted much like my previous kits. & include PDF & JPEG files for both my old & new format as well as the silhouette cut files for the new format. 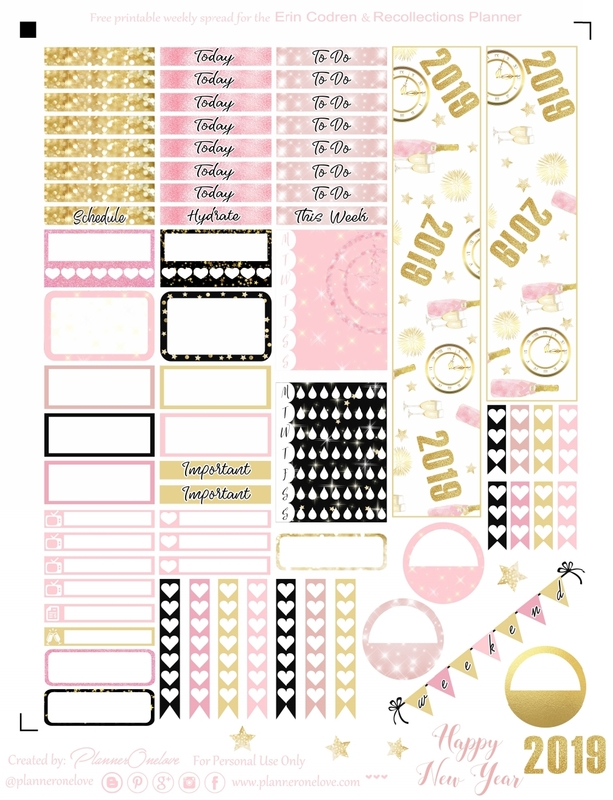 Somewhere down the line I hope to also include the option to choose between Happy Planner & Erin Condren sizes. 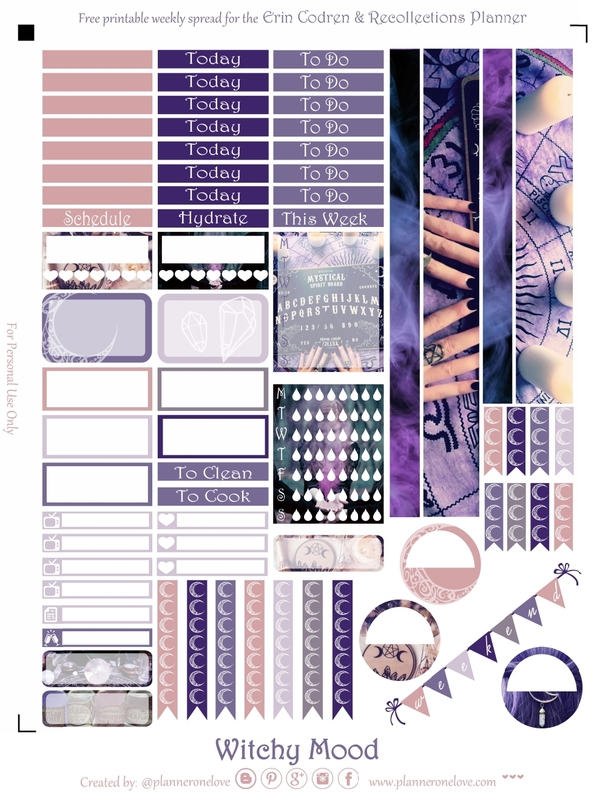 I have been thinking of selling printables for a while now. Even considered opening an etsy shop. But with that comes a lot of work & responsibility. Much of which I don't want to take on now. I genuinely enjoy creating printables & I think most of you will agree that I provide quality content. These kits take time to make & with some even money. Since I've actually purchased some of the clip-art & backgrounds used to make some of my kits. But despite that, it makes me so happy to have the resources & creativity to be able to make printables & share them here for free. & not only that but also to see you all download & use my printables. To share them on social media & take the time to comment on my posts. It seriously brings a smile to my face to know you enjoy them enough to want to plan your weeks with them. 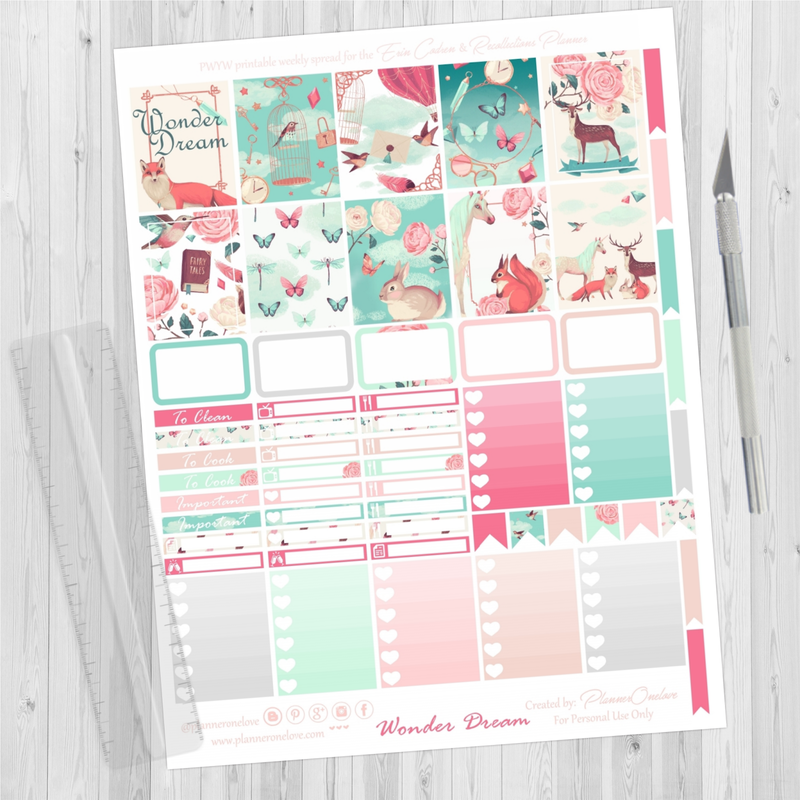 The main purpose of this site is to give my fellow planner lovers a place where they can get awesome stickers, planning ideas, & maybe some inspiration to get creative. But most of all to save you money. That's the reason I want to release these kits as PWYW. 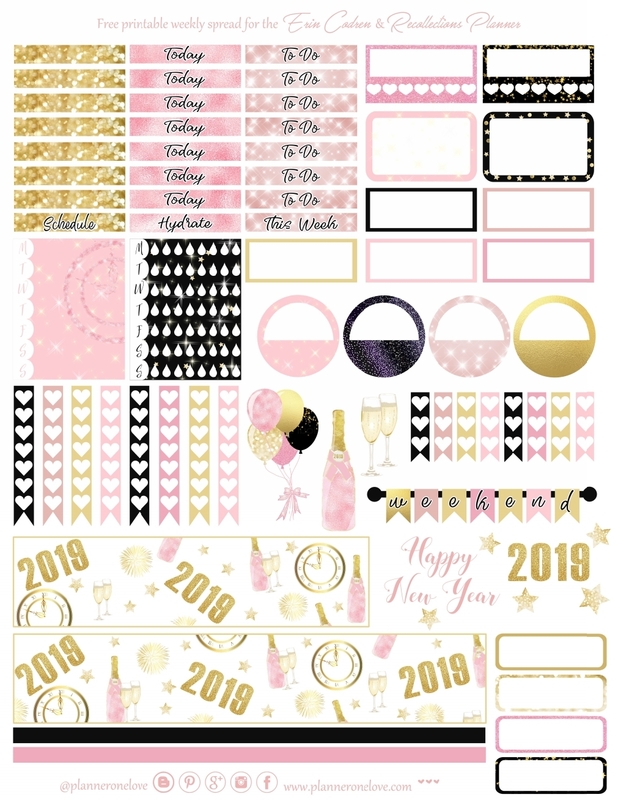 These kits are an opportunity for you to enjoy equally or better quality printables at a reasonable price. While also giving me the chance to get even more creative with beautiful art-work & licensed clip-art. It gives me the chance to make up the cost of running my site. & to be able to continue to provide free content. But don't worry. 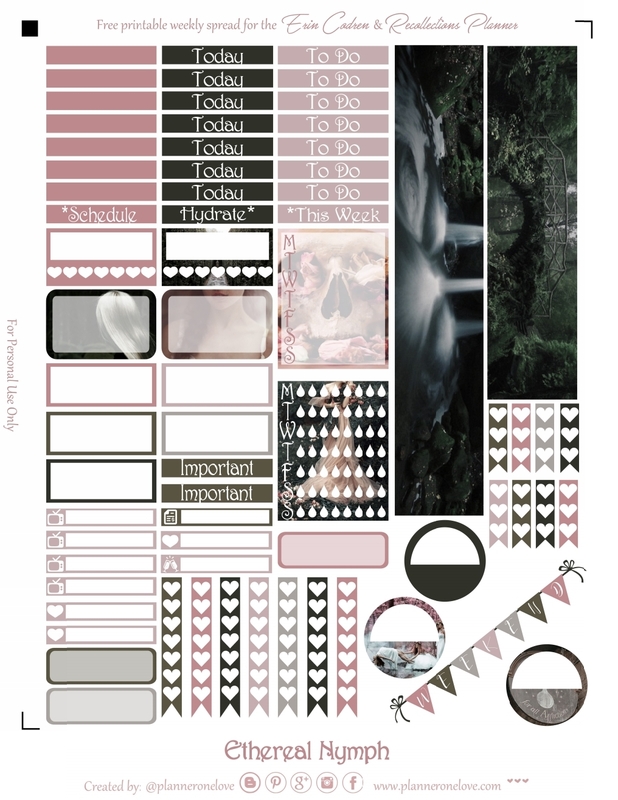 I'm still going to continue to upload & share free printables. You will be directed to my pay-pal page where you can choose your price. Once your payment is successfully processed you will be redirected to the auto-download page. Please Do Not Close the page as it takes a few seconds for pay-pal to redirect you. The files will download in a Zip file. You will have to unzip them first in order to view them. 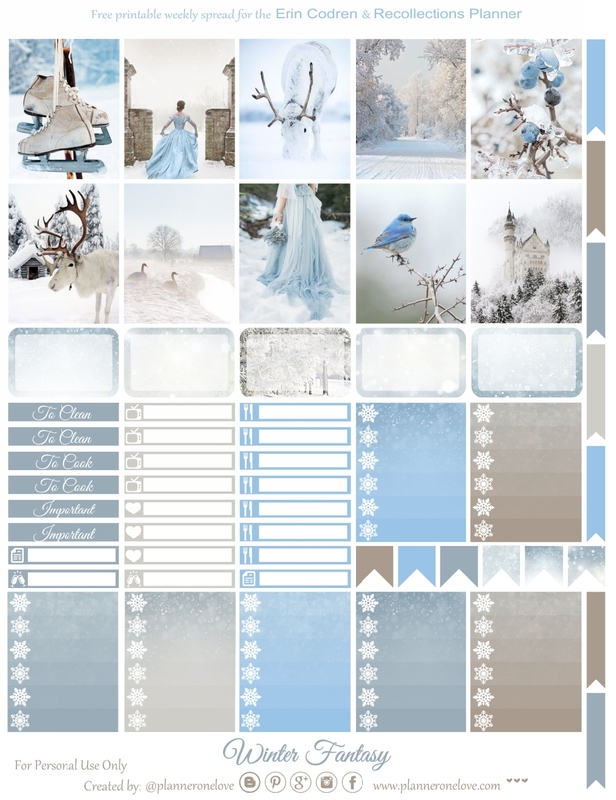 The zip file will include a 2 page printable kit in my regular format & also the new format with cut files. files. 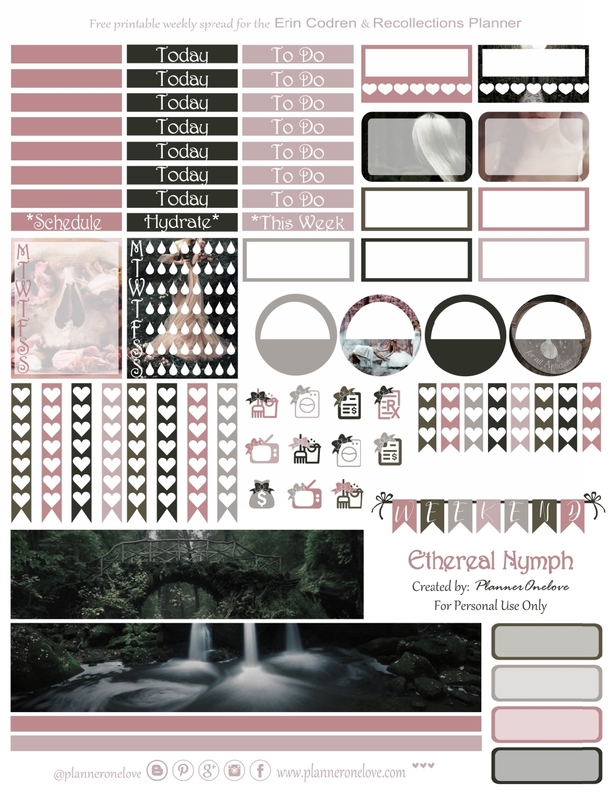 Please allow up to 1 day for me to verify your payment & please make sure to provide a valid email at the time of purchase so that I can send you your Deco sheets. All files will be available after purchase. No physical product will be shipped. I cannot guarantee the colors; every computer screen, printer, and paper is different so your results may vary. Due to the nature of the product, I do not offer refunds. As always this product is for personal use only! Thank you in advance. & please lmk if you have any questions, comments, or feedback I would love to hear it! Don’t hesitate to send me a message and I’ll get back to you as soon as possible. Description: WonderDream. 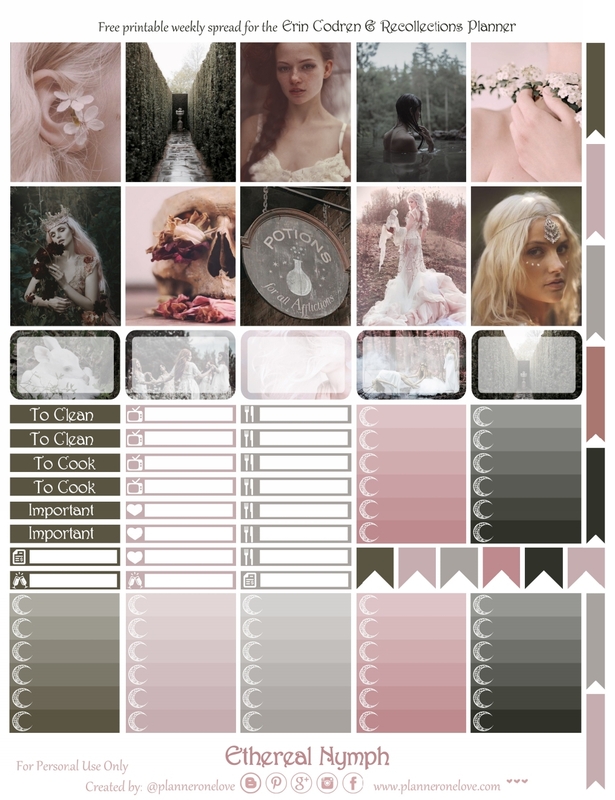 Dreamy/ fairy tale esque printable. Filled with cute animals, butterflies, clouds & magical items. 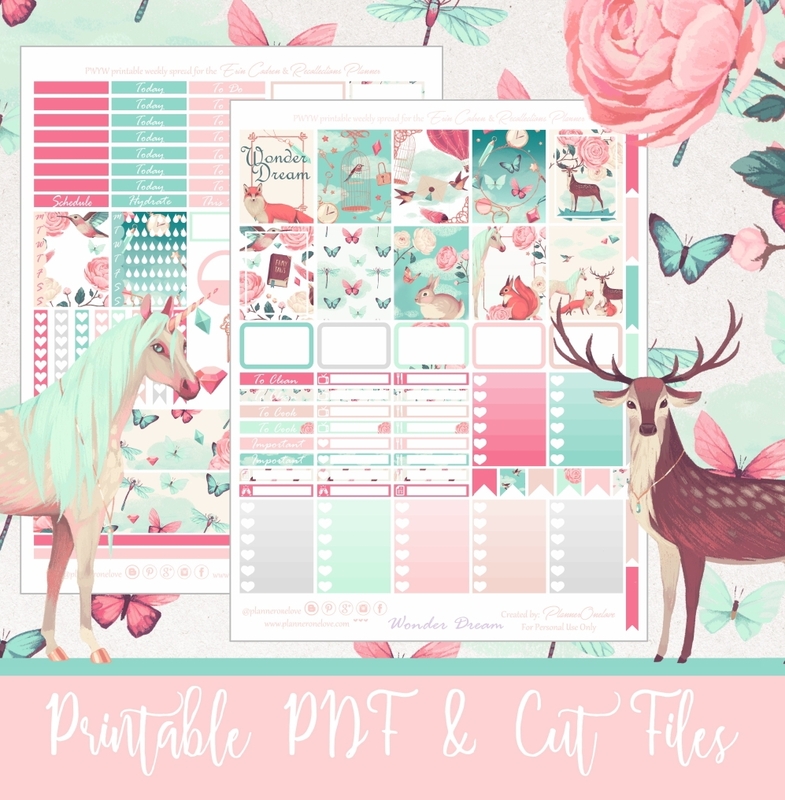 Kit made using beautiful hand-painted pastel clip-art. Instructions: Once purchased, you will recieve JPG, PDF, & Studio files. For Best Resolution I recommend that you print the PDF file instead of JPG. Print onto 8.5 x 11" sticker paper. If you have a Silhouette, print NEW Format. Then open the Silhouette Studio files and send to cut. Cut lines are already traced to make the process easier. If you don't have a Silhouette print OLD Format for an easier design to cut by hand. 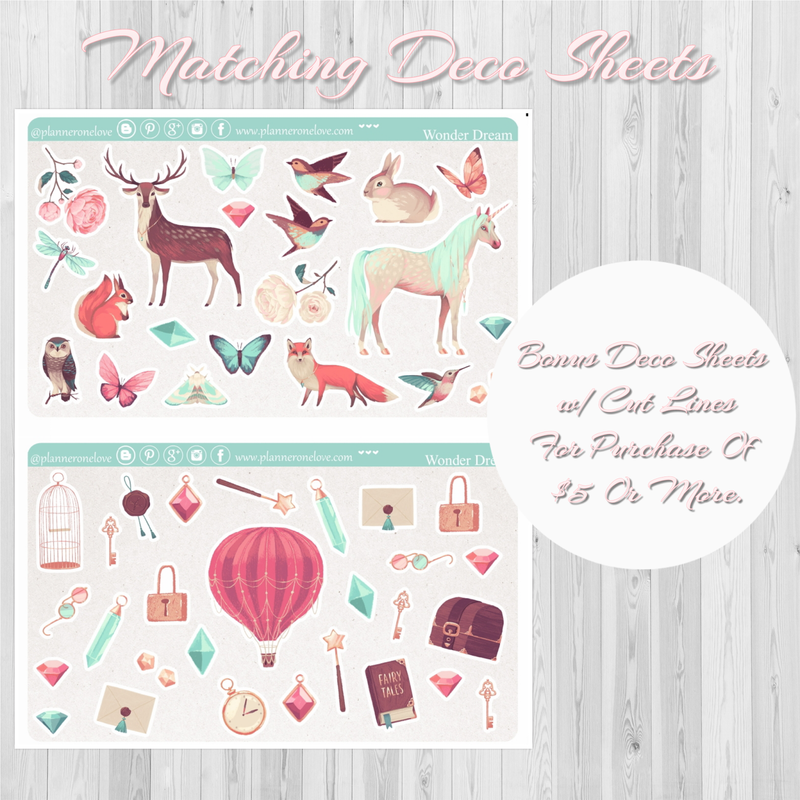 Bonus Deco Sheet: 50+ Matching deco stickers. In small & medium sizes.